As Distracted Driving Awareness Month this April, local, state and federal law enforcement have joined forces to raise awareness about the dangers of driving while distracted. They will also be out in large numbers enforcing the state’s texting and driving laws. Many Oklahomans, along with other Americans, drive while eating, drinking, checking social media and sending emails. These forms of distracted driving go beyond smartphone use and can be deadly because they distract drivers from the road both cognitively and visually. Any activity that pulls your attention away from the task of driving can have deadly consequences. In 2014, 3,179 people died because of distracted driving while another 431,000 were injured in car crashes across all 50 states. The Department of Transportation stated that, during any moment of the 2014 daylight hours, more than 587,000 vehicles were being driven by someone using a cell phone. If you or someone you love has been injured or killed from an automobile accident, call our auto accident attorneys in Tulsa today. In Tulsa, law enforcement is cracking down on those driving while distracted. 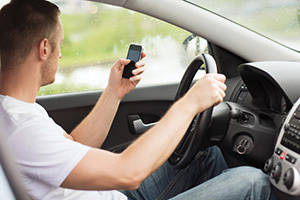 Even though Oklahoma passed a law that bans texting and driving, motorists continue to engage in the dangerous activity. Those caught texting and driving can expect a fine of $211. The law has been in place for six months, during which time Oklahoma Highway Patrol has issued 352 tickets and 525 warnings. In addition, troopers have distributed nearly 1,100 tickets for accidents caused by distracted driving, including phone use. Local Oklahoma Highway Patrol Troopers have noted that distracted drivers are easy to pick out because they typically swerve in and out of lanes, similar to impaired motorists. Since distracted driving deaths are preventable, safety officials are urging drivers to ignore their cell phones when driving and decide to be responsible behind the wheel. At the Edwards Law Firm, we understand how devastating a car collision can be due to a distracted driver. Do not hesitate to contact our auto accident lawyers to discuss your injury claim for free with one of our experienced auto accident attorneys. Schedule a consultation today.